Taking the Juggling for St. Jude on the Road! 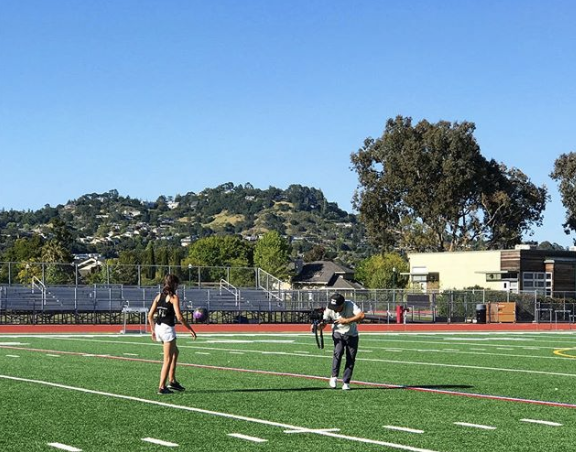 I have been so lucky to be able to take some trips this Summer, and, of course, I’ve been taking my soccer ball and the kids of St. Jude along with me everywhere I go! From Yosemite, to Stinson Beach, to New York, I’ve juggled in some pretty beautiful and recognizable places! It’s not always easy to bring my ball and juggle, but it’s always worth it! Here are some photos of some of my recent juggling adventures. If you would like to see some of my recent juggling, I’ve posted some time-lapse videos on social media. If you would like to DONATE to help save kids with cancer, please CLICK HERE. You can also help by sharing my story and this website with your friends and family! Another GREAT July 4th Parade Spreading the Word about Juggling for Jude! I couldn’t have done it without my amazing crew of girls who walked alongside me and handed out flyers telling spectators about my mission to help kids with cancer at St. Jude. If you’d like to support the lifesaving work of St. Jude, you can DONATE here. I GOT A NEW JUGGLING RECORD!!!!! When I first started Juggling for St. Jude at age nine, I got a lot of new records. As I got better and better at juggling, the records didn’t come as often, and sometimes I would get frustrated by that. At a certain point, I realized that I couldn’t get new records all the time, and that I also had to protect my body and not try for records every time I juggled. For the past two summers, I made a goal of getting one new record each year. My goal for this summer was 2,500. TODAY I GOT 3,215 CONSECUTIVE SOCCER JUGGLES, LEFT/RIGHT FEET! 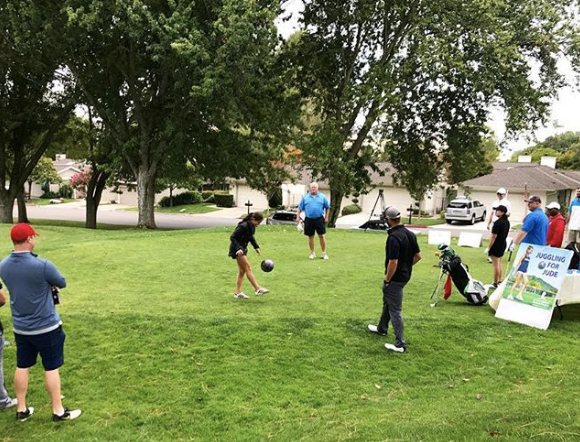 The thing is, kids with cancer face MUCH HARDER battles every single day, so I thought of them and juggled on, and on, and on, until I finally decided to stop. It would be so great if people respond to this new record with donations, maybe $32.15 or $320.15 or any amount, really! Every dollar helps save a life through the lifesaving work at St. Jude Children’s Research Hospital! OFFICIAL JUGGLING FOR JUDE SUMMER 2018 LAUNCH! Yesterday was my first official juggle of my 5th summer of Juggling for St. Jude! Here’s a newsletter I sent out to my donors and supporters. It’s already generated some crazy generous donations! Maybe you’ll be next! Thanks for the support as I strive to reach $300,000 for the kids with cancer! Hi Generous donors, friends, family, and supporters! 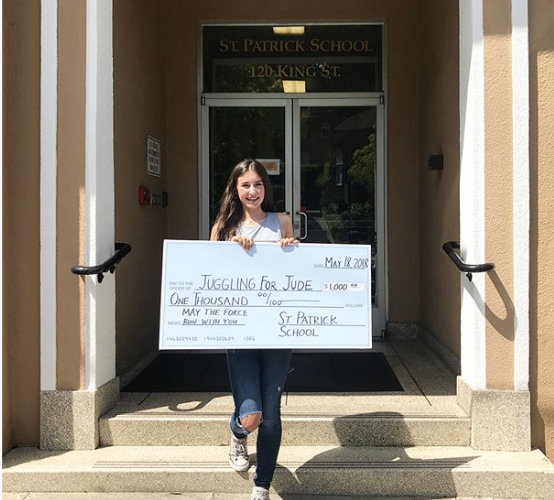 I can’t believe it, but today I officially did my first juggle for St. Jude for this summer! 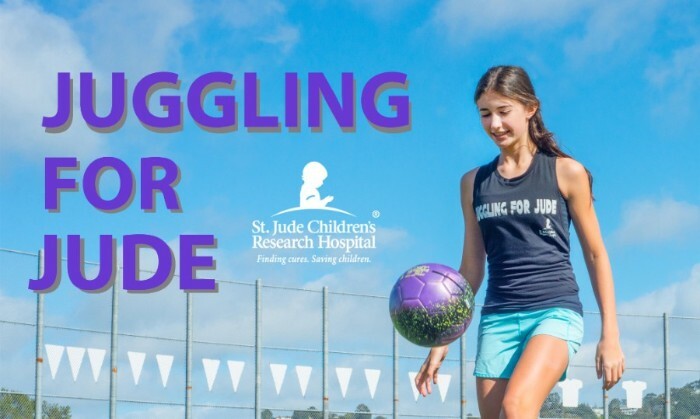 It’s my 5th summer of soccer juggling my way to helping kids with cancer, and I hope you’ll continue to be part of my journey! Below are a few highlights of things I’ve been up to since my last email and some updates on the amazing St. Jude. 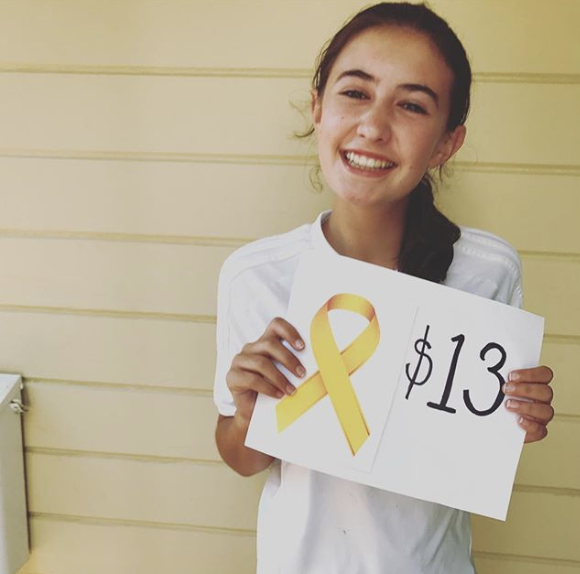 I’ll make it brief and quick, because I know you’re busy, and basically the most important thing to know is that kids with cancer need our help, and St. Jude is leading the way in pediatric cancer AROUND THE GLOBE. I hope you’ll consider a donation, however big or small. As always, you can do that by clicking here, and it just takes a few seconds to change the life of a child with cancer! 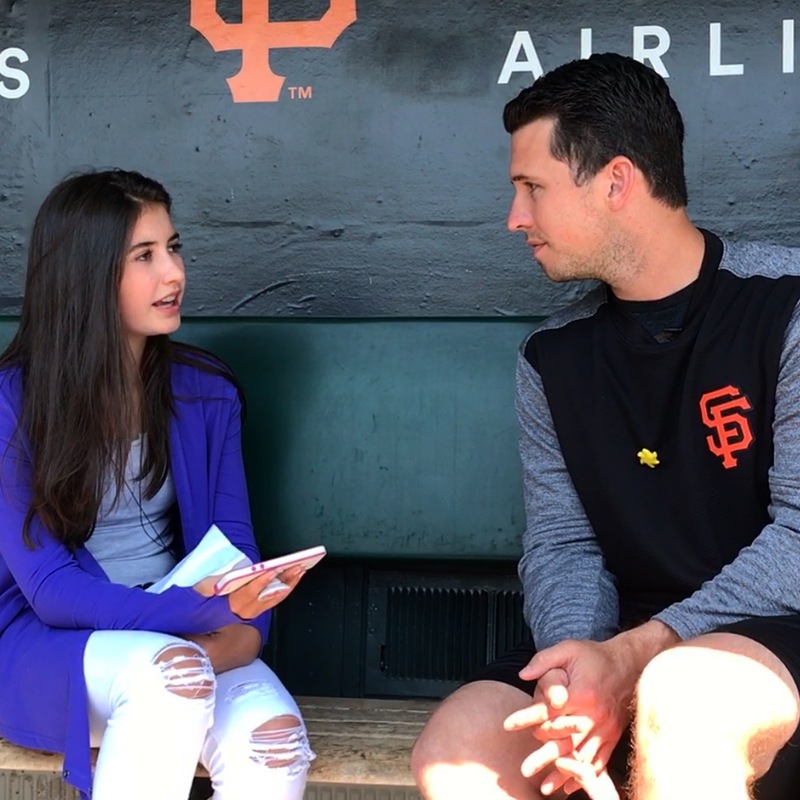 *Interviewed Buster Posey about his work for childhood cancer. *Got a $30,000 check from In-Shape Health Clubs! My biggest donation ever! *Partnered with Pottery Barn Teen in promoting products whose sales benefitted St. Jude. 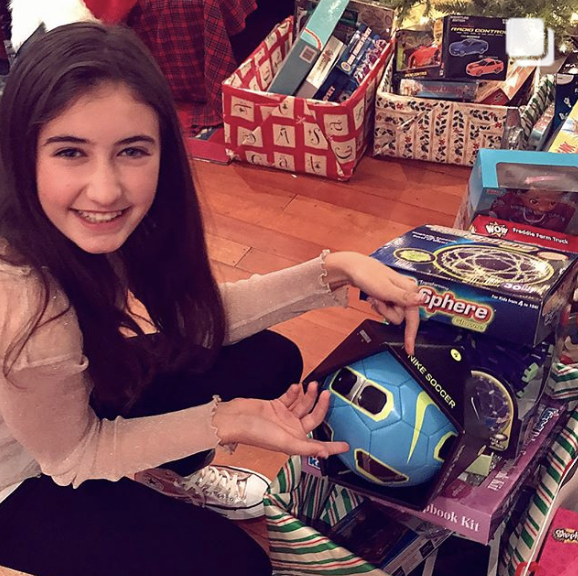 *Toy drive for the kids at St. Jude with Stars Agency sent hundreds of toys for the holidays. 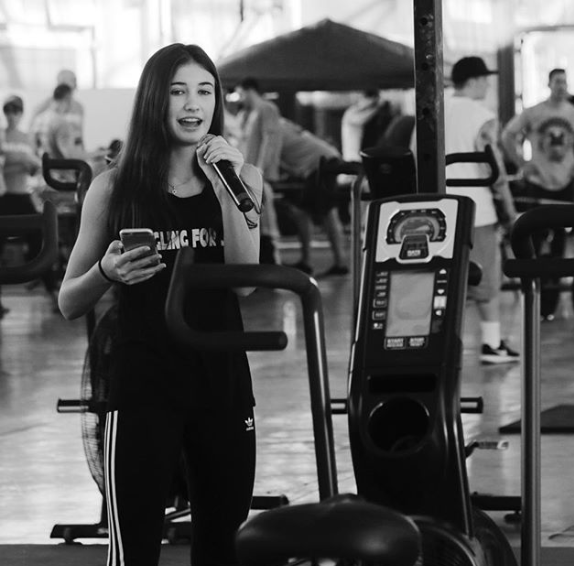 *Spoke at the NorCal Masters fitness event and raised approximately $5000 for St. Jude from the athletes! 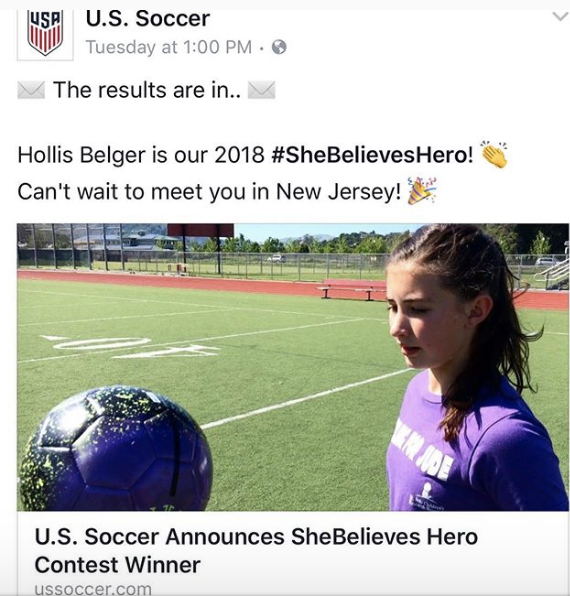 *Won the US Soccer “SheBelieves Hero Award” and got to meet the US Women’s National Soccer Team and help spread the word about St. Jude. *Filmed a 60Second Docs on Juggling for Jude! *Filmed a piece for the international news organization, BBC, which has not yet been published. *More school speeches led to big donations! *Graduated from Middle School!!!!!!! Gave a speech at graduation ceremony about how we can all make the world a better place. If you have 4.5 minutes to spare and want to hear my message, you can click on the photo below. Speaking to my peers at school was challenging for me, but the message was too important not to share! Look at what my grandparents gave me as a graduation gift! 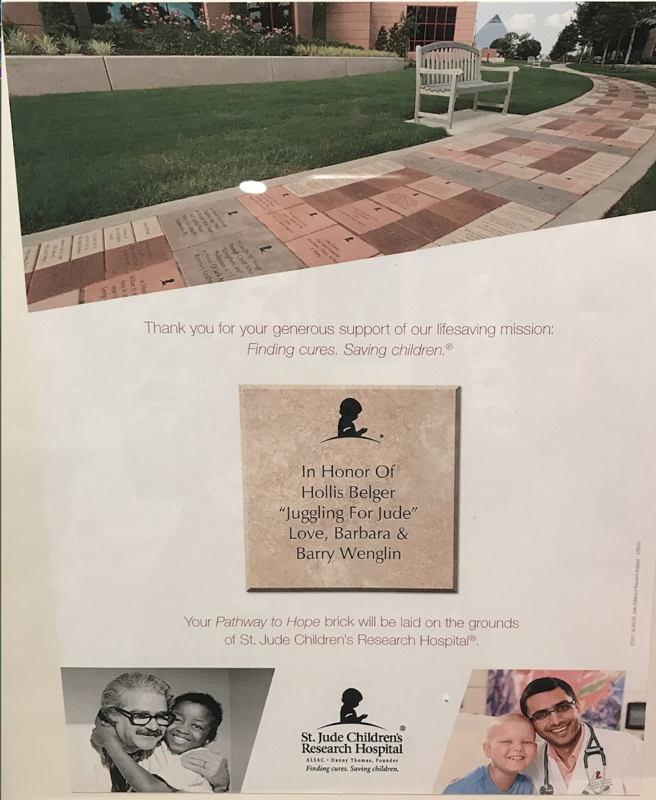 They donated to St. Jude and “bought” a brick honoring Juggling for Jude and all of YOU who have supported my journey! I can’t wait till next trip to St. Jude so I can see it in person! *St. Jude is the first and only pediatric cancer center designated as a Comprehensive Cancer Center by the National Cancer Institute. Furthermore, St. Jude staff published 860 articles in academic journals in 2016; St. Jude researchers are published and cited more often in high impact publications than any other private pediatric oncology institution in America. *While cancer survival rates in the U.S. have risen over the past few decades, more than 80 percent of children with cancer live in low- and middle-income countries, often in areas without access to adequate medical care. Most will die from their diseases—and more children will die without ever receiving a proper diagnosis. *UCSF and St. Jude are conducting an exciting Phase 1/2 trial for X-linked severe combined immunodeficiency disease (SCID), also known as “bubble boy disease.” The trial, led by St. Jude’s Dr. Brian Sorrentino, uses gene therapy to give children a healthy new immune system. UC San Francisco doctors are optimizing low doses of chemotherapy for each patient to minimize any long-term effects. The first children treated in this trial have shown promising improvements. *St. Jude is the coordinating center of the Childhood Cancer Survivorship Study—a long-term follow up study of pediatric cancer survivors, conducted jointly by 30 U.S. and Canadian institutions, including Stanford University School of Medicine and UCSF. *St. Jude is the coordinating center of the Pediatric Brain Tumor Consortium. Lucile Packard Children’s Hospital at Stanford and UCSF participate in this collaborative group that works to speed clinical trials from laboratories to patients. *St. Jude is the headquarters of the Pediatric Hodgkin Lymphoma Consortium, a multi-center effort to develop novel treatment strategies for children with Hodgkin lymphoma. The consortium is led by St. Jude and includes Stanford University School of Medicine and Lucile Packard Children’s Hospital at Stanford, as well as three top medical centers in New England. None of my juggling or efforts to raise awareness would mean anything if people like YOU didn’t respond. Thank you SO MUCH for supporting Juggling for Jude! Thank you for your donations this summer, and of course, please SHARE WITH FRIENDS AND FAMILY who might also want to donate. Don’t forget, I give soccer lessons in exchange for donations! Local families can contact me through my mom at allison@tjsgym.com. And remember, it’s all FOR THE KIDS! Speaking to Young People Inspires me to do MORE! Over the past couple of weeks, I’ve had a chance to speak at a number of schools, which has been great! 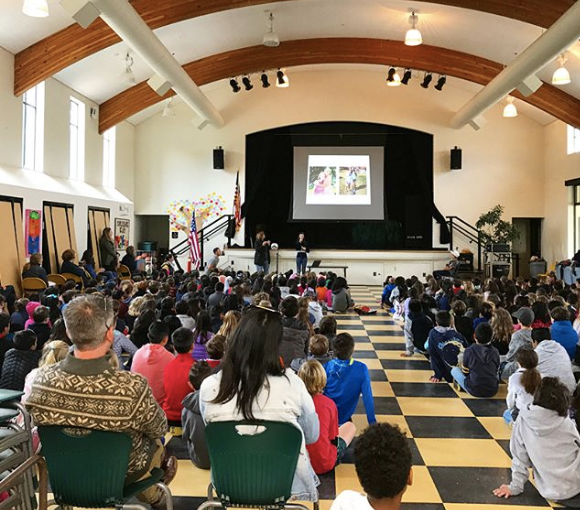 Each time I share my Juggling for Jude story and talk about how other kids can find a way to give back, I get inspired to do more work, myself. Seeing the excitement in other kids and hearing from parents and teachers about how inspiring they think I am, makes me want to do even more for the kids at St. Jude. 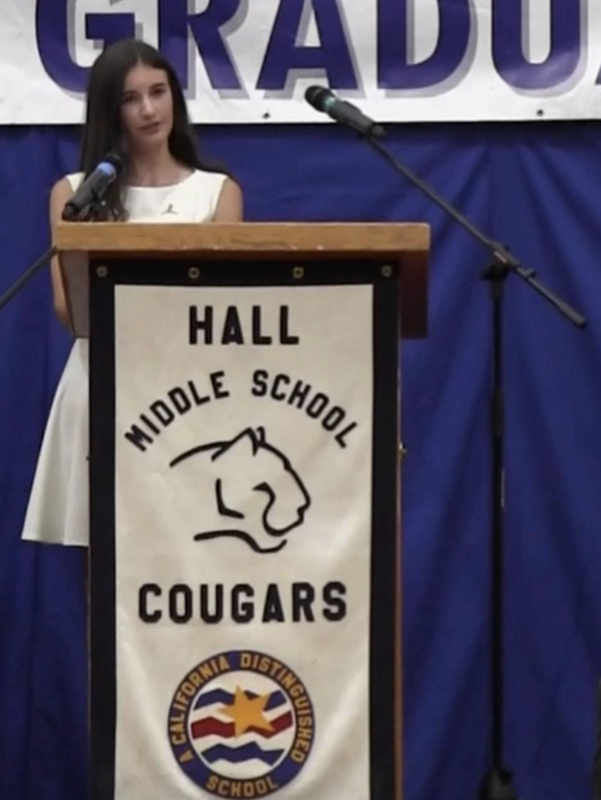 Public speaking can be difficult and even scary for some people, but I LOVE it! It feels great to spread such important information about the lifesaving work at St. Jude and to encourage others to give back. And, of course, it doesn’t hurt that sometimes people who hear me get inspired enough to make a donation to St. Jude! That happened a couple of times last week, and it made me so happy! If you’re inspired to DONATE, just click HERE. 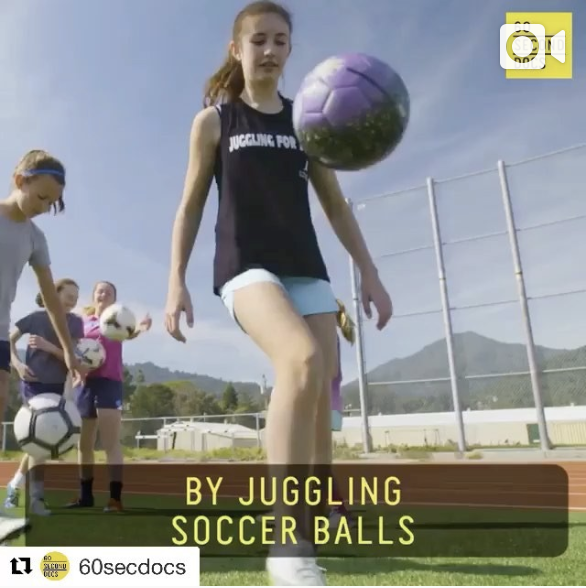 Big Thanks to 60 Second Docs and Red Bull/NeymarJrs Five for Sharing the Juggling for Jude Story! I am so honored to be the final story in a series of five stories about women (and a girl!) making things happen in the world of soccer! The series is called Playing for Change, and it was put out by Red Bull and NeymarJrs Five, with mini documentaries produced by 60 Second Docs. Here are links to my story on Instagram and on YouTube. As always, if you’re inspired by my efforts and would like to donate to help cure kids with cancer, please CLICK HERE. It takes less than a minute to help save the life of a child with cancer! Thanks to Amy Poehler’s Smart Girls for Sharing My Story! I am so honored to be on the Amy Poehler’s Smart Girls website! Stories there have inspired me in the past, and now I’m hoping that my story might inspire someone else! You can read my interview on the site HERE. 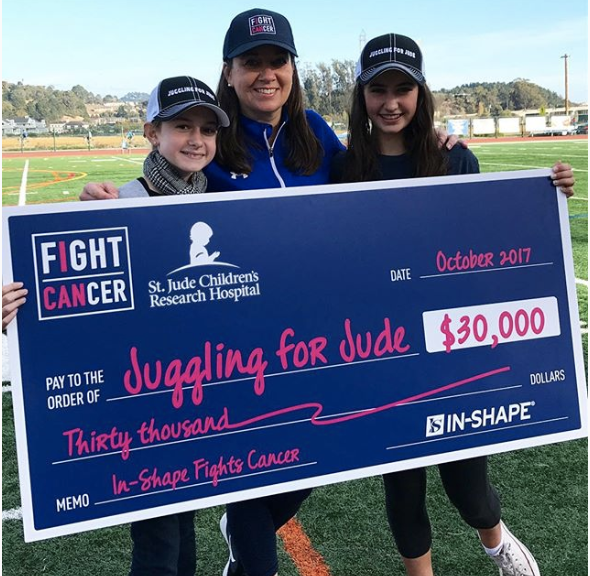 As always, the best part of getting publicity is getting more people to know about Juggling for Jude so they might be inspired to donate. Maybe you will be inspired by this interview and will DONATE today.